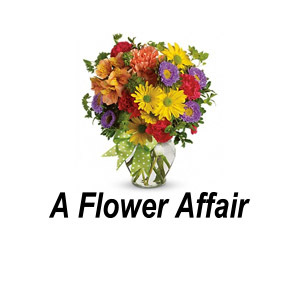 A Flower Affair is a specialty store offering contemporary or traditional styles for every holiday and all life cycle events such as births, weddings, funerals, birthdays and anniversaries. We are pleased to offer a 10% discount to MTS cardholders excluding delivery charges, on all orders of $25 or greater. We specialize in floral arrangements, potted plants, gift and fruit baskets, balloons, stuffed animals and giftware. Impress someone today and contact us! Phone or email orders are welcome. Located at 833 Sherbrook Street, Winnipeg. Contact us by phone at 772-0355 and 1-800-297-3364; by e-mail at gabor@afloweraffair.net or visit our web page at www.afloweraffair.ca.